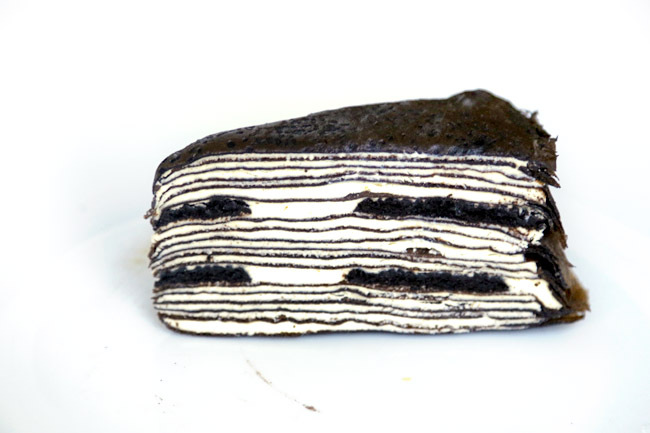 The Mille Crêpe Cake has slowly found its way to popularity in Singapore. 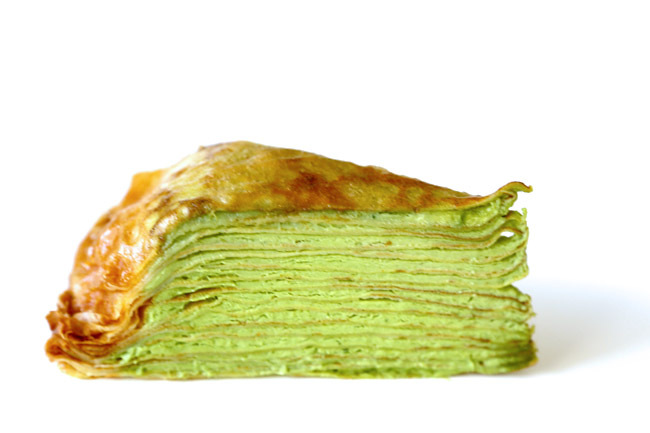 The word mille means “a thousand”, implying many layers of crêpe (like very thin pancake) stacked up together. 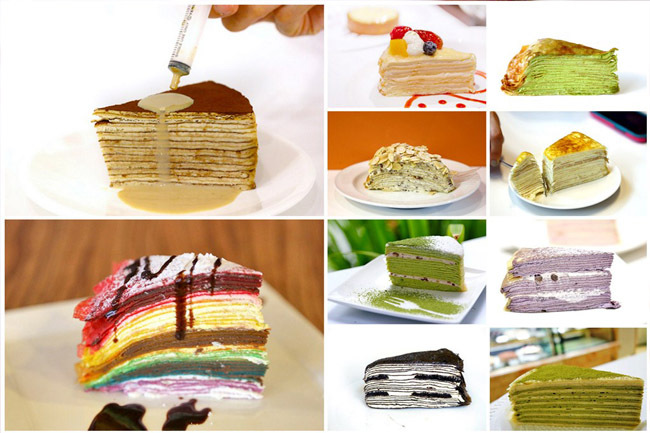 Most of the crepe cakes in Singapore contain between 10 to 20 layers. Although the components seem straight-forward with layered crepes and pastry cream, the construction is about skills and the perfect recipe. Every slice has to stay firm and neat after cutting, and still taste light and moist. You can choose either to peel layer by layer, or take a bite of its entirety. My method is the former. Here are 10 Mille Crêpe Cakes In Singapore. Koskos is a hidden find at the basement of Hong Leong Building, founded by the same team behind SPRMRKT. The Rum & Raisin Mille Feuille ($8.50 for 1 slice, $59.50 for whole) has velvety Crème Chantilly layers with rather intense taste of rum. If you wonder why the cake taste so ‘alcholic’, the raisins use are soaked in Jamaican dark rum for weeks to infuse the full flavour, then blended so that you can get a mouthful out of every bite. Alcoholic and creamy – I like. The main challenge though is that the cake overall is rather soft, and may present difficulty if you intend to eat it some time after takeaway. 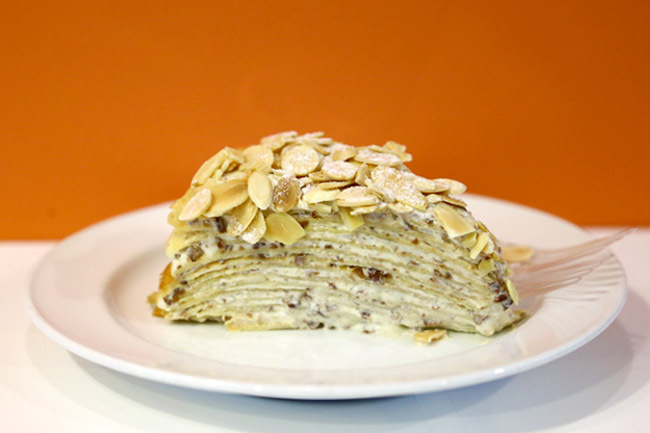 The success of the entire Lady M chain from New Year Upper East Side to Singapore can be attributed to its winning Mille Crepe cake. The Chocolate Mille Crepe (available only at Orchard Central) while costing more than a red-coloured note, with its twenty paper-thin handmade chocolate crêpes alternated with chocolate pastry cream and a caramelized surface, redefined smoothness and elegance for contemporary cakes available in Singapore’s cafe. Rich yet not indulgent. 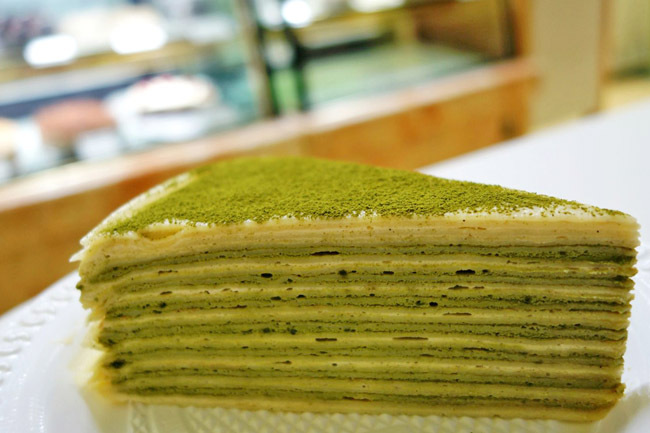 By a small margin, I still prefer the Green Tea Mille Crepe ($9/slice) where the sweetness of the pastry cream weds the subtlety of the fine green tea powder. I didn’t know First Love Patisserie was from Indonesia. 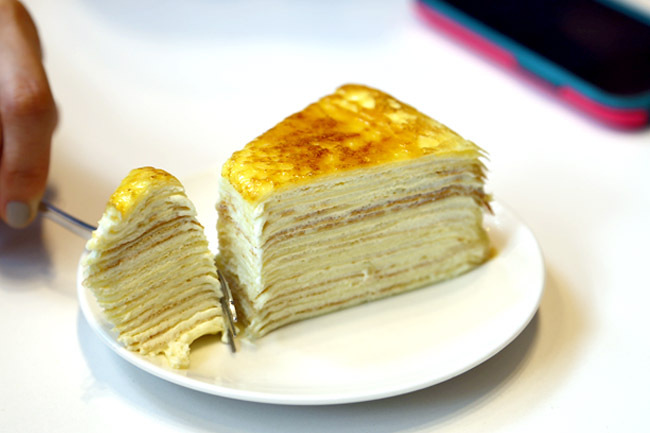 The Mille Crepe Cakes can be found in two kiosks in Singapore, with flavours of French Vanilla, Mango, Cappuccino and Tiramisu available only for takeaways at $6.50 per slice. The cakes based on an old Japanese Hokkaido recipe using natural vanilla beans, doesn’t taste too sweet. I liked its OREO flavour – surprisingly light and creamy. Many know about Udders ice cream, but fewer realise there is an Udders Pancake selling Mille Crepe Cakes at Lorong Kilat. 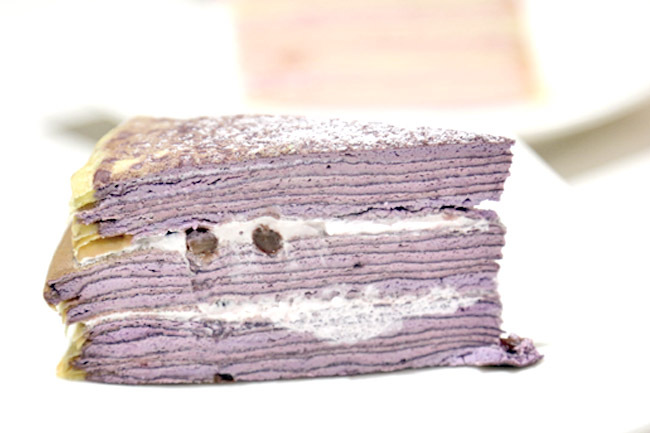 Their Mille Crepe cakes are made fresh daily using eggs, flour, milk, brown sugar, and molasses. 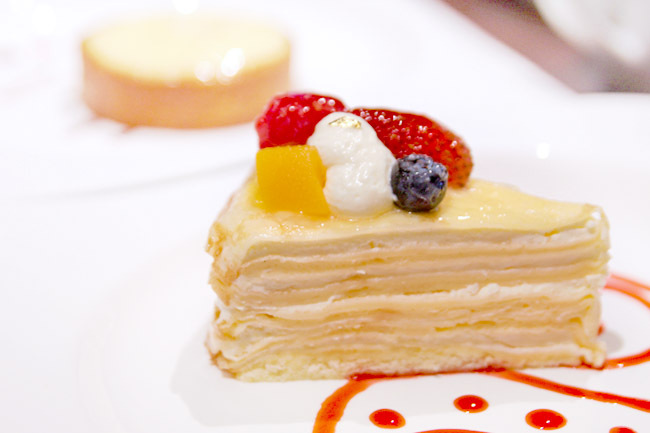 Each crepe cake has around 20 layers of crepe, laid on layer-by-layer with whipping cream and mascarpone cheese. The Baileys Tiramisu ($11.90) liqueur crepe cake is the eye-catcher, topped with a syringe filled with 100% Baileys Irish Cream (we call that ‘chut pattern’ food). So we squirt the Baileys over the cake before eating it. Emm, fun. The Mille Crepe ($9, also one of the cakes there at the cheaper range) has alternating ten soft flaccid crepes with sweet custard cream. One of the must-try cakes if you are on a ‘tai-tai’ tea-time outing at Henri Charpentier Dempsey, where booth seats are spacious with silky draping, all looking rather French and romantic. Matcha please. For those craving for a taste of Japan, Doutor Coffee’s Mille Crepe cakes are flown in from Japan in limited quantities. 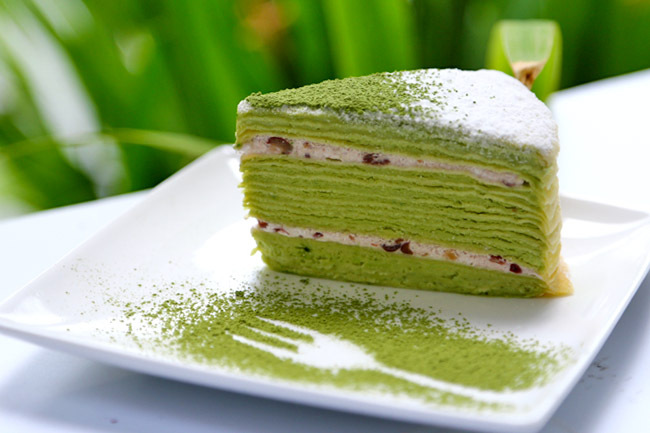 One of the few cakes around where there is the more distinct taste of the green tea, matched with smooth and light cream. Doi Chaang Coffee offers some of the hugest variety and interesting Mille Crepe flavours in Singapore. 10 in total, priced at $6.90 per slice, $60 for the whole cakes. The most popular ones being Matcha & Azuki and Earl Grey. Other top flavours include Hokkaido Chocolate Milk, Chocofee Praline (chocolate + coffee), Tiramisu and French Vanilla. Halal Café I AM has expanded quickly in a short period of time, and a factor for its popularity can be attributed to its colourful Instagram-worthy bakes. 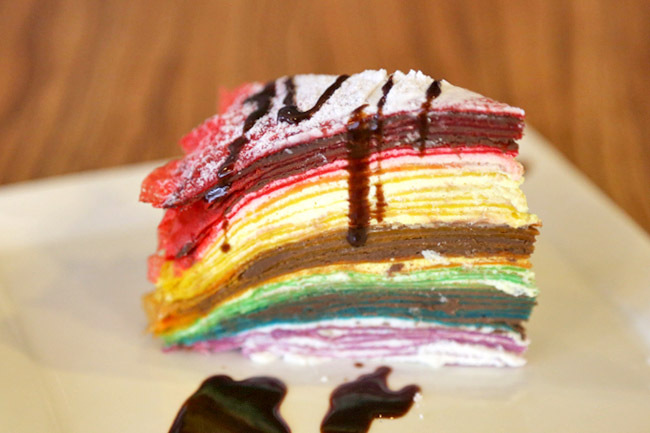 Their photographic Rainbow Mille Crepe Cake ($8.90 per slice, $80 for whole) made by the owner’s mother has white and dark chocolate cream in between layers of crepes, served with chocolate syrup drizzle for a sweet and rich treat. 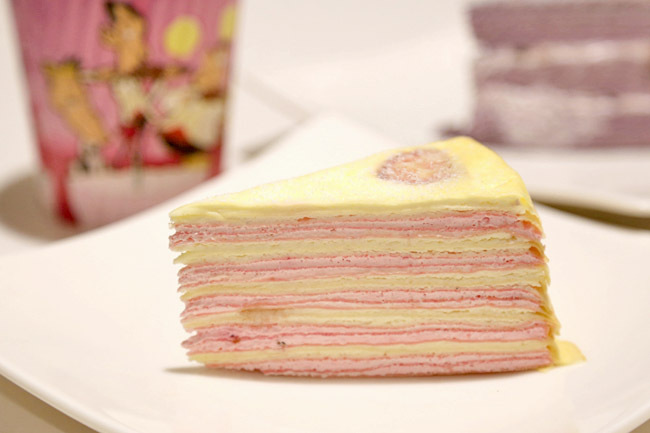 Classic Cakes at Sunset Way is considered one of the first shops to introduce the Mille Crepe Cake to Singapore. Other than the Original, Chocolate and Coffee flavours, the Apple, Matcha and especially …. Durian Mille Crepes have earned fans with creamy D24 durian fillings. Its freshly-made vanilla pastry cream, thin eggy crepe layers plus caramelised sugar topping make a wonderful combination. Hmmm…. The Beantastic Rainbow ($8.80) and Strawberry Mille Crepe ($8.00) are worth many Instagram likes – but they can be too sweet, conquered by saturated colourings, and lined with cheap-tasting cream. So what we will recommend if you happen to be there, go for the Yam & Red Bean Mille Crepe ($8.00) which is somewhat different from the other flavours out there. Hi EZT, I actually tried Paris Baguette twice. It was my 11th. Yes, I did think about it, my first was okay-dry, the second was horrid. Consistency issues. Teddy & Me, several were sub-par, but its yam overall was better than PB. Taste is subjective – depends on what they serve that day anyway. Nice list of all the mille crepe places! That udders version does leave me eager to try it soon! Yes yes, thank you for recommending. any of these cafes halal?